Some wonderful new books were brought into the world this year. I love them and am grateful for their safe arrival. My favourites have included Rowan Williams's brilliant study of tragic theatre, The Tragic Imagination (one of the best books he's ever written, if you ask me); Richard Hays' masterful and memorable Echoes of Scripture in the Gospels; Ian McEwan's delightful novel Nutshell, narrated by Hamlet as a baby in the womb; Stephen Backhouse's biographical page-turner, Kierkegaard: A Single Life; Geoff Thompson's timely theological provocations, Disturbing Much, Disturbing Many; Leo Damrosch's gorgeously illustrated Eternity's Sunrise: The Imaginative World of William Blake; Tom Wainwright's entertaining and sobering Narconomics: How to Run a Drug Cartel; and Sandy Maisel's informative American Political Parties and Elections: A Very Short Introduction (terrific series, by the way). And what about the books I haven't got to yet but am saving for a rainy day? Larry Hurtado's Destroyer of the Gods: Early Christian Distinctiveness in the Roman World looks especially good; so does Catherine Chin's edited volume Melania: Early Christianity through the Life of One Family and Bruce Gordon's John Calvin’s Institutes of the Christian Religion: A Biography and Fleming Rutledge's The Crucifixion: Understanding the Death of Jesus Christ. I greet you, all you new-born books! May the world treat you kindly! May God's blessing keep you always, may your wishes all come true! May you stay forever young! May you make your authors rich, or at least not destitute! Martin Luther, The Annotated Luther (Fortress Press) – 4 big volumes so far, with 2 more still to come, very handsomely produced with big wide margins and an inviting layout, each text nestled in a wealth of historical information (footnotes, anecdotes, woodcuts and other illustrations from the period, extensive introductions to each work, etc). One would always prefer to be reading Erasmus: but if one has to dip into Luther from time to time, this is the way to do it. Fortress Press are a mighty engine-house when it comes to new English editions: if you haven't got the 17 volumes of their Dietrich Bonhoeffer Works, then I chide you. Edmund Burke, Reflections on the Revolution in France, and Other Writings (Everyman's Library) – 1200 pages of Burkean sanity in the always-lovely Everyman's Library edition, red cloth, gilded spine, gold ribbon, just like the books they made in France before the revolution. This one's not so good on Burke's major works (only the Reflections is included in full, the rest are excerpted), but it does make room for innumerable little pamphlets and speeches and letters and whatnot, always worth reading for Burke's inimitable prose style. T. S. Eliot, The Poems of T. S. Eliot (Johns Hopkins University Press) – 2 massive volumes, about 2,000 pages' worth, all that you could ever want (and more) of this most modern of modern poets. And since Eliot was also perhaps the greatest essayist of the 20th century (Virginia Woolf is just as good – but who else is in their league? ), how could I be forgiven if I failed to mention the same publisher's multi-volume critical edition of Eliot's Complete Prose? Reinhold Niebhur, Reinhold Niebuhr: Major Works on Religion and Politics (Library of America) – Well technically this was more than a year ago, it came out in April 2015, but who's counting? For less than 30 bucks you can get your hands on 800 pages of Niebuhr, including four complete books and a whole archive of sermons, lectures, prayers, etc, much of it never published before. John Maynard Keynes, The Essential Keynes (Penguin) – Did you know how much fun it can be to spend an afternoon reading Keynes? Do yourself a favour and give it a try. This goodly ten-dollar paperback crams in 600 pages of Keynes – not only the economics but also a sample of his immensely insightful and entertaining thoughts on politics, culture, biography, etc. Keynes tends to be remembered only as an economist which is a shame since he was one of the most cultured characters of his day, a member of the Bloomsbury Group and a scintillating essayist with wide interests and boundless curiosity. 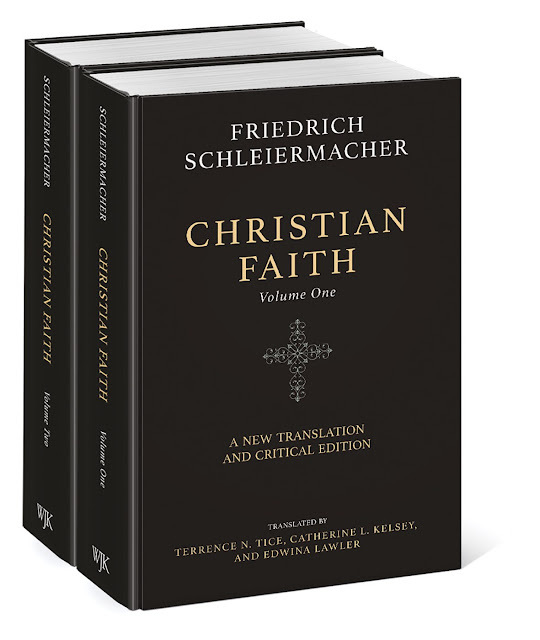 And the other day this one arrived, the mother of all new editions, a massive scholarly labour, a playground erected over the crater of the theologians: Friedrich Schleiermacher, Christian Faith: A New Translation and Critical Edition (WJK) – 2 volumes, well over a thousand pages, newly translated by Terrence Tice and Catherine Kelsey, with thousands of footnotes on Schleiermacher's German vocabulary, sources, etc, and with a most marvellous 60-page "analytical index of topics" that provides a key to Schleiermacher's intricate tapestry of concepts. I say this without a trace of irony: I read the whole index right through and found it riveting. I was riveted! It's a wonderful new edition and an exceptional achievement. So there you have it, reader. By all means read the new books. But by even more means, read the old ones too. For to write new books is human; to publish old ones divine.